BlogAmazon Connect Has Some Killer Features – Where to Go From Here? Amazon Connect Has Some Killer Features – Where to Go From Here? There is no doubt that Amazon Connect is on a trajectory to become a powerhouse in the contact center space. In true Amazon style, the product has been released in MVP (Minimum Viable Product) stages, which allows Amazon to test and learn while gathering customer feedback which then helps shape and drives the product backlog. After all, they are on a Mission to be Earth’s most customer-centric company. Amazon Connect is 19 months old, having been released on 28th March 2017 (Amazon Release). In the last year, Amazon has been building and releasing functions that allow you to see how they are thinking about the product and the potential it has. Being released with a controlled feature set (a single API for example, no Voicemail) re-enforces Amazon’s focus on value Vs feature parity. 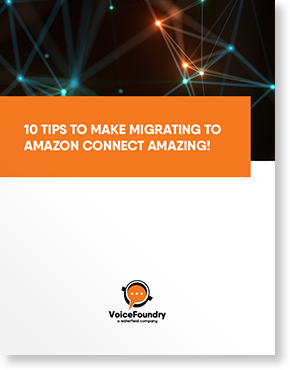 For example, recording all your calls is super easy and including the ability to make Lambda calls is a killer feature that takes Amazon Connect out of the walled garden and opens up the contact center for extremely rich data integrations allowing for personal, natural and dynamic customer interactions. If you’re new to Amazon Connect and would like to know more, check out this very informative video by Amazon’s Chris Bergin from 2017. With such a solid bedrock of a platform, 2018 has seen a significant delivery schedule. That’s a lot! And the above is not an exhaustive list. The cadence of functions being released feels like it’s increasing which could be happening because of the big Vegas conference, AWS re:Invent, being around the corner, or the fly-wheel effect or team capacity increasing…I suspect it’s a mixture of all three! What’s clear is that Amazon is investing in this platform and people are taking notice. 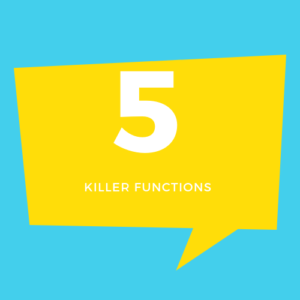 Aside from being a catchy title and a draw, “5 Killer Features and Where to Go From Here” has real value to customers…and in my view, it won’t be long before we see Amazon produce them. AWS is well known for price cutting and Amazon Connect comes with a very transparent and easy to follow pricing strategy with no set-up fees, no monthly commitments, no per agent costs etc. BUT, AWS is a pioneer in the pay-for-what-you-use economy. This dates back to their very first service for storage S3 over a decade ago. Recently Amazon held true to this in a big way by changing the Pricing of Ec2 (Servers) from Per Minute to Per Second Billing. Amazon is doubling down on Alexa and there is no secret that the whole voice eco-system has undergone a paradigm shift in the last few years. All of the big tech companies are trying to impress with their voice experiences that wow and bring delight into our everyday lives. Alexa is used every day in our homes to assist with cooking, homework, home automation and entertainment. My youngest enjoys putting items on the shopping list and she’s only 5! She is also taking over my music choices! When released, Amazon Connect also had integration with LEX, which is the Natural Language Understanding (NLU) engine that drives Alexa. Lex provides a chatbot experience within Amazon Connect… Alexa style. Today the only way to interact with Amazon Connect today is via Telephony, which is expensive and not as available. Developing on Alexa has synergies with Amazon Connect, in that they both integrate with AWS via Lambda. Thus a well-designed system can start to use the same logic and you code once for both systems – or at least share your work between the two. In addition to this, you’re able to export your LEX bot into Alexa. Currently, we cannot use Alexa to integrate with the ACD Features of Amazon Connect in that we cannot speak with a real human. This integration would need to be carefully considered but it would also be a very natural progression forward. Let’s assume you’re traveling in your semi-autonomous vehicle and it breaks down. You ask Alexa to invoke your vehicle breakdown insurance and, using the GPS of the car, Alexa is able to tell the control center where you are and advises that help will be with you in 30 minutes. You then get a text message with the confirmation and registration of the assigned support personnel. You can then ask Alexa to speak with the control center, she connects you to an agent who has the full context of your interaction and provides the help you need quickly. What a great experience this would be for the Customer AND Agent. The balance between usability and security is hard and getting this wrong can make or break a business idea. When we call our bank today we are asked different questions than those asked on a mobile app (Why are we even asked questions? I just need to look at my iOS App). This level of complexity is outdated. It only adds to customer frustration, in addition to security failures, which drives up additional call volume, average handle time AND agent pressure. We are seeing improvement in Voice biometrics. Pindrop did a demo on stage featuring the CIO, Vijay Balasubramaniyan, who made a purchase. Then a colleague tried to do the same transaction – but Alexa denied the request. Pindrop has a solution for Amazon Connect which is currently in for Risk Score. Current solutions provide a ‘risk score’ using different that the IVR and/or Agent can use to authenticate the customer. As authentication improves over the years with solutions like Passport, inbound phone fraud will be reduced as will customer frustration. Will we get to 100% confidence level on 95%+ of interactions? Designing enterprise-scale systems is hard, building them in your own Data Centers is very hard, and in today’s world, it might not differentiate you from the competition. Using Cloud Computing solutions like AWS, G-Cloud and Azure give you an incredible amount of options to get it right. Amazon Connect is “server-less”, in that there are no servers to manage, patch or ensure they are up and working. Amazon does all the heavy lifting for you – and they do it all within a Region. A Region is a Geographic location such as London/Paris/Oregon. These Regions have Availability Zones (AZ). An AZ is a Data Center so a Region is highly available and thus, so is Amazon Connect. You can learn more by reading this amazing post by Amazon’s Adrian Hornsby, The Quest for Availability. However, the bar is always rising and regulation may require you to plan for failure of a Region. Amazon has been releasing some features to support this in stages over the last few months, currently, you need to design for this in a specific way to meet your needs. This will improve over time, it’s a complicated problem to solve. This is not such a crazy ask, as AWS has been raising the bar on their flagship DynamoDB solution that now supports Global Tables. Amazon has already released Quick Starts which we will discuss more in a future blog. Since launching the Quick Starts just a year ago, the inventory has grown from 4 to 16 Quick Starts. VoiceFoundry has our own place within the Quick Starts with the ServiceNow connector. These canned integrations provide amazing features that would historically have taken a significant effort from a custom to achieve. Getting this right is going to commoditize the Contact Center further, which has been going through a slow and painful transition over the last few years. I’m very excited by this capability and looking forward to seeing this grow! For now, I’ll leave you with the potential to build integrations with other SaaS providers with a few clicks, allowing for faster time to market and more competition, adding significant value to the customer. Amazon Connect is well poised to disrupt, and Contact Centers are a mesh of complex processes, people and technologies. Having the flexibility and unique features of Connect are enabling small and large customers to choose Amazon Connect as their strategic cloud-based Contact Center. With a healthy release of new functions since the product was released, the Amazon Connect portfolio is growing in strength and the future is exciting. Please feel to ping us on Twitter or Contact Us.